Another NHL season is upon us and once again fans get to look at their team and decide whether or not they have the goods to make a run to win the Stanley Cup in 2019 or will they be trading away some of their veteran players to the teams on the list below. Some big free-agent signings and some big trades in the offseason made some teams instant contenders whereas other veteran teams sat back and decided whether or not they had the goods to make another run at it with their core group of players that have led them to the playoffs in the last few years. 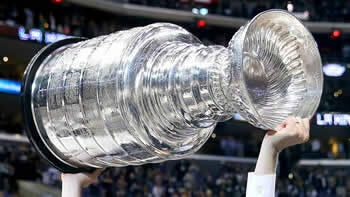 It may be late to take advantage of some of these teams as a bet to win the Stanley Cup as some of their odds have changed quite a bit but keep them in mind because if some of the teams below get off to a slow start the odds could change and placing a bet or two for the season could pay off nicely by June for you. DraftKings – DraftKings is one of the BIGGEST DFS sites in the world – And, by joining DraftKings here and get into a free Fantasy Hockey Contest for real cash prizes when you make your first deposit of $5 or more! FanDuel – Get up to $20 in FREE money when you join FanDuel here. Being official partners with sites such as DraftKings, FanDuel, Fantasy Draft and Draft, etc... we may receive compensation or other benefits for advertising. Please help us improve our content by using our links which will also earn new players the best bonuses and deals at each site! San Jose Sharks– No team made a bigger splash in the off season than the San Jose Sharks. Signing Evander Kane and then trading for EriK Karlsson just before training camp began San Jose went from a very good team to a powerhouse Stanley Cup favorite overnight. Already in a stacked conference San Jose looks to basically make their run now and figure it out as they go along. Will be the early favorite to win the Stanley Cup in 2019. Nashville Predators – Has Nashville missed their opportunity? For two years in a row Nashville went into the season as heavy cup favorites only to get bounced before winning it all. Now it seems like San Jose, Winnipeg and even Vegas are leading the charge in the conference, Nashville will be hard pressed to make another run. But, they have enough talent and it wouldn’t shock anyone if they were the ones hoisting the cup in 2019. Vegas Golden Knights – The Vegas Golden Knights came within 3 games of making history last year by being the first expansion team to make it to the Stanley Cup Finals. Although some changes have been made most of the core team remains intact and it’s a question now whether or not last year was a flash in the pan or will the miracle season continue for another Stanley Cup run in 2019. Winnipeg Jets – Many picked Winnipeg to beat the Vegas Golden Knights last year and have the best chance for Canada to bring home the Stanley Cup. However, Vegas’ miracle run ended Winnipeg’s shot at the cup forcing a regroup. This team has solid goaltending, solid offense and solid defense and the chemistry needed to make another deep run. The Jets should make the Conference Finals and a be favorite to win the Stanley Cup in 2019. Toronto Maple Leafs – The Maple Leafs made one of the biggest splashes of the offseason by signing John Tavares arguably the best free agent of the summer. Joining a team that features Auston Matthews Mitch Marner and William Nylander this young team could really make a run at the East Conference Final to get to the Stanley Cup and maybe even break the 50 plus year curse. Pittsburgh Penguins – How can you not consider a team with both Sidney Crosby and Evgeni Malkin as perennial favorites to win the Stanley Cup in the NHL. Bounced last year by the Capitals in second round of the playoffs last year this team is still solid and tinkered a bit during the off-season to once again be a true contender for this year’s Cup finals. Boston Bruins – The Boston Bruins went from a nothing team in October and November that was losing games to one of the best teams in the NHL by the end of the season last year. All this while also missing their best player Patrice Bergeron for parts of the regular season and some playoff games. Look for the young kids to have a year of experience under their belt and a better chance this year going deeper into the playoffs. Tampa Bay Lightning – Seems like every year the Lightning are favored to make a run to the Stanley Cup and why not - they have a solid group of stars with Stamkos, Kucherov and Hedman and have been to the playoffs and the Cup Finals. This team knows what needs to be done and how it needs to be done. The Lightning will definitely make the playoffs and will be scary to face in the first couple rounds of the playoffs. Edmonton Oilers – The Oilers two years ago were in the playoffs and making noise. Last year expectations were high and then the wheels fell off and the Oilers missed the playoffs altogether. With a young team of stars including Connor McDavid leading the charge look for the Oilers to once again come back to the playoffs and could possibly make another run at the Cup Final as the forgotten team in the West. Free Entry (min $5 deposit)! What Is Daily Fantasy Hockey? Copyright © 2019 Play Daily Fantasy Hockey (www.playdailyfantasyhockey.com) - All Rights Reserved.